Top 8 Reasons to Call a Locksmith - Lakeway Locksmith Your Trusted Locksmith Company. 1. Automotive Emergencies. Imagine you’re distracted getting out of your car. You hit the door lock button as you climb out and slam the door shut. That’s when you realize you left your keys behind in the ignition! A mobile automotive locksmith can visit your location, get your vehicle unlocked and retrieve your keys. 2. Residential Emergencies. You go outside to get the newspaper in your pajamas and the door slams behind you, leaving you locked out with your family unavailable to come and let you in. An emergency locksmith can be dispatched to the scene to help you get back inside your home and stop giving your neighbors a peek at your nightclothes! 3. Changes in Family or Rental Situations. In the unfortunate event that you have to evict a tenant or ask someone who’s living with you not to return home, a residential locksmith can be called to change the locks and provide you with new keys. 4. Broken Keys & Damage to Locks. You were trying to turn the key in that stiff front door lock, but it snapped off in the process! A mobile locksmith can visit your home or business, remove the broken key and repair or replace the lock if it’s damaged. 5. Lost Keys. After looking everywhere, you just have to accept the fact that your house, business, car or motorcycle keys are gone for good. A certified locksmith can help you decide what the best solution is. Do you need to replace the locks entirely or can you simply get by with new keys? Whatever you decide, the locksmith can help with key cutting and lock repair and replacement services. 6. Break-ins. You’ve been through a terrifying break-in or home invasion that’s left your front door lock broken. 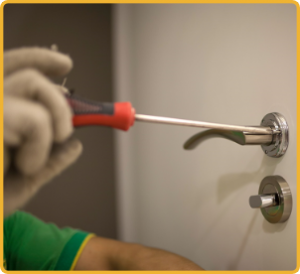 An emergency locksmith can visit to get your home secure again with new locks. He or she can even discuss stronger, more tamper resistant lock options to give you an enhanced feeling of security. 7. Safe cracking. You lost the keys or combination to the safe at work or your personal safe at home, or the safe has broken and just won’t open. A certified locksmith can get the safe open and then make new keys, repair the safe or set a new combination, so that you can continue to use it. 8. Commercial Security Audits. You’re concerned about the safety of your business and want to make sure your current system of interior and exterior locks is adequate. A commercial locksmith can conduct a complete security audit to identify vulnerabilities and then recommend repairs to correct them.